Statistically, more than 50% of the global “feeder fleet” is older than 10 years. This leaves considerable room for technology and operational improvement. The feedership segment is particularly interesting from an environmental perspective, because it mainly operates in near coastal areas. A reduction of emissions will, consequently, contribute to an improvement in air quality for the population in these areas. 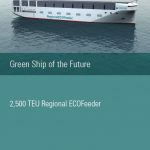 The core purpose of the regionalECOfeeder project is to develop a better and more energy efficient feeder ship design. This includes radical improvement of the ship systems in terms technology, energy consumption and operation. Furthermore, we aim at reaching a significant reduction of cost per TEU/nautical mile compared to current levels in terms of operational and manning and realizable within the next 2-3 years. Cross industry collaboration between partners is a key element in all GSF projects in order to enhance innovation, knowledge sharing and co-creation. Relevant partners and their competences are included early in the project development process, before finalizing project contents. The process around the RegionalECOfeeder was designed accordingly, with a significant element of co-creation. Project owner, Odense Maritime Technology, pre-defined the emission targets, but left the actual identification of suitable technology to the partners. Furthermore, the suggested technology was to be assessed in combination with other technologies, in order to develop and evaluate on the system entities, rather than the individual solution. This required continuous knowledge sharing and collective evaluation throughout the project. Regional ECOFeeder design provides an immediate 30% CO2 reduction compared to the average feeder fleet. This is obtained by applying significant changes to the overall design, by including the most energy efficient technology available and by reducing turn-around time in port terminals. The ECOFeeder design is a result of collaboration between OMT and technology suppliers, ensuring optimal interaction between the applied technologies to obtain maximum energy efficiency. The feeder segment is dominated by an aging fleet, ready for gradual renewal. If the renewal is carried out responsibly, significant amounts of both fuel and emissions can be saved over the coming years. by simply applying the available technology, while we, at the same time, continue the search for next generation fuels for the maritime industry.